The importance of education to national development cannot be over-emphasized. At the centre of education, is the teacher, whose knowledge, competence and delivery, play a key role in learning outcomes. Education in Ghana has over the years, undergone a lot of reforms in line with global trends to ensure best practices and standards. The dictionary defines the word ”Standard” simply as a level of quality or achievement, especially one that people generally consider normal or acceptable. In line with the current educational reforms to transform teaching and learning and improve educational outcomes, final year students of Universities and Colleges of Education are required to write Licensure examination by the National Teaching Council to assess their standard. The National Teaching Council (NTC) was set up by the Education Act 2008 (ACT 778): to improve professional standing and status of teachers, license and register teachers in Ghana. Its mandate is to promote excellence and professionalism among teachers and managers of schools by ensuring standards at all levels of the educational system through effective regulation and supervision of teacher education programmes, promotion of continuing professional development, maintenance of discipline and leading the overall process of transforming education delivery. When the initial announcement on the Licensure examination was made, some students and friends of Colleges of Education contend that the exam was to prevent people from getting employment. This assertion might have been borne out of misinformation and the natural phobia people have towards exams in general. However, contrary to this view, the licensure examination is to ensure that we have quality teachers to teach our pupils and raise the standards of teaching in Ghana. It is to ensure that those not qualified but desirous of maintaining their jobs upgrade to become better teachers. Lastly, it is aimed at preparing our teachers to be globally accepted. Initial reactions to the maiden professional standard test were, however, quite surprising but not unexpected. It was quite amusing to see such reactions because examinations have always been the means by which teachers themselves measure the standard of their students. So, what was the fuss all about? According to Cobbold in his thesis on Professionals without a Profession? The Paradox of Contradiction about Teaching as a Profession in Ghana captured in the Journal of Education and Practice, (2015), “It was found that while teachers saw themselves as professionals, they did not think that teaching in Ghana qualified as a full-fledged profession. For a long time, teaching was considered as a “transit profession” by students who are unable to gain access to the universities. They used teaching as a route to improve their grades to the university. Unfortunately for such intellectual dreamers, the teaching profession had since blossomed into an enviable destination of distinction, attracting the brightest and the best professionals. Such negative attitudes continue to raise concerns on the quality and standard of teachers who are in charge of shaping both the academic and moral standards of our children. It has therefore become obvious that the teacher whose role determines learning outcomes needs to undergo further assessment after completion of their training to ensure that they meet the right standard to help improve teaching and learning. In line with the above, the NTC came out with the National Teachers’ Standards as a professional tool to guide teacher educators, teachers, student teachers and other stakeholders in education to identify in clear and precise terms what teachers are expected to know and be able to do, qualities they expected to possess and some behavior they are supposed to exhibit. The standards also prescribe that all teachers completing their initial training will be assessed against the National Teachers’ Standards which are designed to improve the quality of teachers’ delivery and students’ performance. An attempt in 2010 to implement the NTCACT was met with difficulties. However, through the untiring efforts of Hon. Dr. Matthew Opoku Prempeh, Minister of Education and his deputies, and Dr. Evelyn Oduro, Executive Secretary for NTC and her officers, the initial difficulties were resolved and this has paved the way for the implementation of the Act and subsequently, the Licensure Examination. 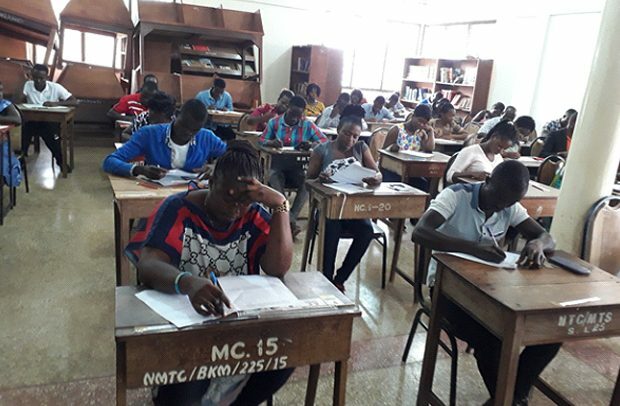 The maiden Licensure Examination was held from the 10th to the 12th September 2018 in forty (40) centres across the country. Twenty-eight thousand, seven hundred and fifty-seven (28,757) candidates made up of 24,678 Diplomates, 3,886 first degree holders, seven(7) Master’s degree holders and 186 Post-Graduate Diploma in Education candidates took part in the examinations. Statistics from the Licensure examination results indicate that out of the total number of 28,757 candidates who sat for the exam, 21,287(74%) passed and 7,432 failed, 12 results were cancelled and 26 results withheld pending investigations into examination malpractices. These results reflect the reality on the ground. It is sad to note that the 7,432 candidates who failed have found themselves in classrooms. What better results do we expect from their students? The number of candidates who failed shows that the Licensure examination is very necessary. Furthermore, it has also vindicated the status of the National Teaching Council in its gate-keeping role to ensure that teachers meet the standard of the profession. It therefore behooves the various stakeholder unions to wholeheartedly support the NTC in its quest to ensure the best for the teaching profession.